Methanosulfonic acid is an effective catalyst for esterification, alkylation and condensation reactions. It is an useful chemical in polymer and electronic industry. 99% MSA is mainly used in the pharmaceutical industry to manufacture active pharmaceutical ingredients, while 70% MSA is used in electronic indusrties. 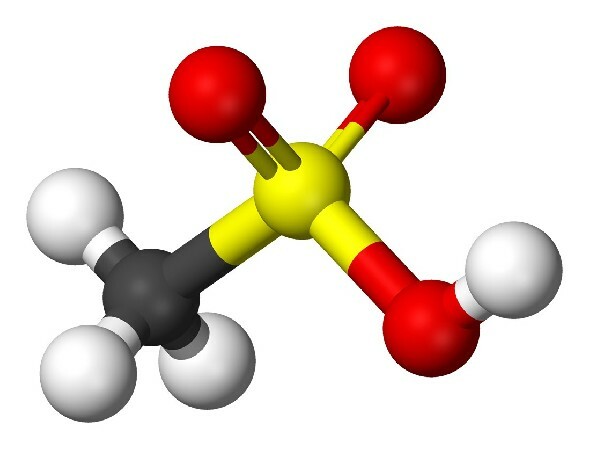 Methanesulfonic acid (MSA) is a strong, odorless, colorless to yellow liquid with the slight, sulphurous odor. It is soluble in water, slightly soluble in benzene, toluene, insoluble in paraffins. Methanesulfonic acid is easy to handle and non-oxidizing. Incompatible with amines, bases, strong reducing agents, ethyl vinyl ether, hydrofluoric acid and strong oxidizers. MSA is a solvent for numerous metals. It is less corrosive than many other acids. Readily biodegradable, not labelled toxic. Methanesulfonic acid is an ideal catalyst for esterification, alkylation and condensation reactions. Most of the common acids and alcohols are used in Methanesulfonic acid catalyzed esterifications. Methanesulfonic acid effectively catalyzes the polymerization of tall oil rosin, wood rosin, and grain rosin. It can also be used to produce starch esters, wax oxidate esters, benzoic acid esters, phenolic esters, or alkyl esters. MSA can be used at low temperatures, with very few by-products and impurities. The MSA catalyst is not deactivated by water. Methanesulfonic acid, because of its similarity to hydroxymethanesulfonic acid, has been investigated as a catalyst for finishing cotton to produce durable-press properties. Fibers for composites where both carbon fibers and polyaramide fibers are treated with methanesulfonic acid are reinforcement and their strength is improved. Polyaramide fibers may also be directly spun from MSA. Methanesulfonic acid allows post-crosslinking of vinyl polymers in macroporous polymeric adsorbents. Optical light-emitting devices (OLEDs) are based on thin luminescent polymer films which have been spin-coated from methanesulfonic acid solution. Methanesulfonic acid has been used to modify electrically conductive polymers. MSA based electrolytes are being actively investigated as environmentally superior alternatives to the currently used systems. MSA is particularly suited for battery applications due to its high purity and the absence of chloride and of interfering metal cations. Methanesulfonic acid is considered for storage batteries of the types: zinc/cerium, chromium(II)/cerium, vanadium(II)/cerium and titanium(III)/cerium. Using MSA allows the concept of a battery with a lead(II) soluble in the electrolyte, using carbon electrodes and no cell separator. Methanesulfonic acid has been the technical standard for tin-lead plating in the printed wiring board industry. It starts out to become the standard in pure tin plating and in Sn/Ag, Sn/Bi, and Sn/Cu plating in this industry, too. MSA helps to prevent sludge formation in electrolytic baths and offers higher plating efficiency at high current densities than other acids. Silver, nickel, copper and zinc electroplating are developing markets for MSA. It is used advantageously in electroplating of noble metals such as gold, platinum, palladium and their alloys. Methanesulfonic acid has been used to design selective electrochemical stripping procedure that only dissolve one metal while they leave the other unaffected. MSA can be used to regenerate cation exchange resins. The acid can be recovered by electrowinning to remove the dissolved metal. There are organic stripping compositions containing Methanesulfonic acid which are useful in removing polymeric organic substances such as photoresists, rubber adhesives from inorganic substrates. Methanesulfonic acid is attractive for surface modification reactions because it is at the same time a nonoxidizing and a strong acid. In aluminium surface treatment MSA has been used in a two-step process or anodizing and coloring of aluminium. Moreover, it can be used for electropolishing of aluminium. Mehtanesulfonic acid is highly suitable for manufacturing active pharmaceutical ingredients such as telmisartan and eprosartan, angiotensin II receptor antagonists. Cyeing and color filmindustry (production of Disperse Red 343). Chemical intermediate for manufacture of pesticides, petroleum refining and lube oil additives. Alumina-based, sprayable cement can be partly neutralized with methanesulfonic acid. Organophilic clays have been made by partly neutralizing clay with methanesulfonic acid. Crystalline aluminosilicates such as zeolites may be readily dealuminated using MSA to provide catalysts or catalyst precursors.